The Life of Bon: What are we going to do about daylight savings? 1) I am older, and humans by nature like to complain more when they get older. I suspect that with every passing year humans find more things that bother them until we all die as cranky 89 year olds. Every birthday I have I find two or three more things in this world to be bugged by and add them to my list. Daylight Savings made the list this year! 2) I now have a child. June did not get the memo that we have all decided to shift our schedules one hour. She wants her schedule the same. She's being quite unruly about it, really. Today she was an absolute mess by 6 pm. I held off. You can't put a baby to bed at 6 pm! She'll be up awake by 5 am! But she kicked and screamed and begged to go to bed. I put her down at 6:30 with a blanket and she curled right up and was passed out cold before it was 6:32. There will be hell to pay in the morning! 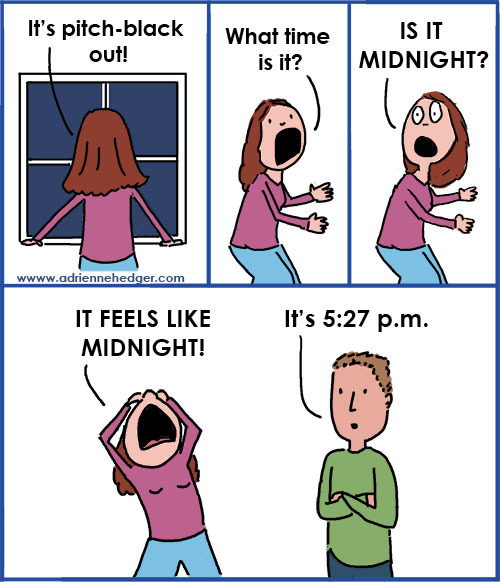 Daylight savings I blame you for this! Of course, the easiest thing would be to not have daylight savings at all. I kind of think I wouldn't mind it if we never shifted the hours. But then people in Arizona sans daylight savings tell me that summer is horrible with the sun coming up at 4 am and all. That sounds miserable. And I admit I love the sunlight in the summer evenings. July nights when it's still light at almost 10 pm are on my list of very favorite things in this world. So I guess we could keep us on the daylight savings schedule forever? But that won't work because then the sun won't come up in December until 9 am. THIS IS NOT ALASKA, PEOPLE, WE CANNOT LIVE LIKE THAT. Even now, in October it's pretty much dark until 8 am and that is horrible says every school teacher ever. There isn't much that's more depressing than waking up, getting ready, and driving to work in the pitch black. It's dark as midnight and you're on your way to a full day of seventeen year olds = constant depression and dread. Here is my solution. It ain't a good one, and it doesn't solve much. But it's better than a current monstrosity. I say we go back to the daylight savings switch being in October and April NOT November and March. (Why did this change? Does anyone know? Who makes all these crazy daylight savings decisions and how do I stop them?!?) November is too late to change our hours back and March is too early. By February I'm just starting to get a little light in the morning again and then the daylight savings gurus go and steal it away from me again. Having the hour switch in November and March punishes people who start their days early. That ain't nice! People who wake up early and get their butts to work should be rewarded with sunlight! Don't get me wrong, I LOVE the extra light at night, but I certainly don't think we need it as early as March. Let us early risers have some light too! What is your perfect daylight savings solution? Certainly there has to be one!